rec. 2014/15 Rossini Saal, Bad Kissingen; Großer Saal, Musikhochschule Würzburg; Kammermusiksaal, Steingräber, Bayreuth . Much loved by his circle of friends, Parisian composer Francis Poulenc seemed incapable of writing anything unappealing or uninteresting. Claude Rostand affectionately described his friend Poulenc as “part monk, part rascal”. 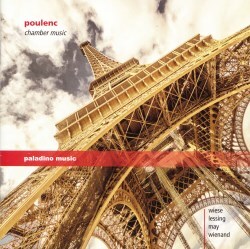 An exquisite craftsman, Poulenc wrote in most genres: eminently accessible songs, instrumental, chamber, orchestral music and opera all generally bursting with melody, alive with charm and abounding in joie de vivre. On the other hand his powerful opera Dialogues des Carmélites set against the fear and disorder of the French Revolution and a number of late sacred choral works show a more serious side. In 1942/43 Poulenc composed his Violin Sonata in occupied France where he remained during the war years. Premièred in Paris in 1943 by Ginette Neveu with Poulenc accompanying the sonata was revised in 1949. One of the composer’s most heartfelt compositions the score bears a dedication to Spanish poet and dramatist Federico García Lorca who was murdered by Nationalist forces at the outbreak of the Spanish Civil War. Violinist Kolja Lessing and pianist Eva-Maria May are on sparkling form in the opening Allegro and communicate a sombre quality to the central Intermezzo that serves as an elegy for Lorca. Passionately committed playing marks the Finale: Presto tragico creating a sound-world predominantly inflected with frantic anxiety. Written in 1957 for flautist Jean-Pierre Rampal, the enduringly popular Flute Sonata is dedicated to the memory of American music patron Elizabeth Sprague Coolidge. Demonstrating their empathy, flautist Henrik Wiese and pianist Eva-Maria May are on splendid form. The remarkable playing of the Allegro malinconico is full of life with the melodic Cantilena radiating a sense of melting infatuation. Bringing the work to a close the scampering Finale marked Presto giocoso swells with impish high spirits. Between the years 1932/59 Poulenc wrote a collection of 15 character pieces in a range of moods for solo piano known as Improvisations. Wienand and May play three each of the miniatures giving fresh and enjoyable performances. Written in 1952/53 the Sonata for Two Pianos has become an established part of the two piano repertoire. Poulenc dedicated it to American pianists Arthur Gold and Robert Fizdale who gave the première in 1953 at Wigmore Hall, London. Cast in four movements including a Prologue and Epilogue the duo distinguish themselves providing plenty of nuance and a broad tonal palette. I especially enjoyed the reflective Andante lyrico which is played with a restrained passion that reveals an undercurrent of melancholy. Collectively and individually it would be hard to imagine finer exponents of this marvellous music. Wiese, Lessing, Wienand and May provide sensitively characterised performances. Recorded at three locations under studio conditions the engineering team maintains a consistently high level of sound quality: vividly clear and well balanced. Lovers of French music will relish this beautifully produced release.